You dear, dear readers. 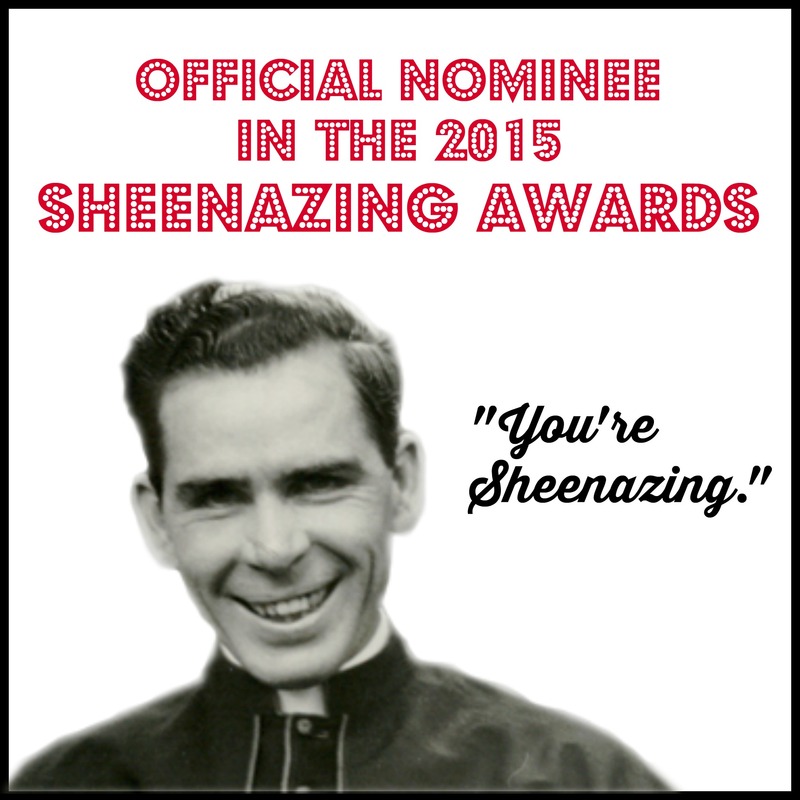 THANK YOU for nominating me for a Sheenazing Award! If you haven't already, please vote now! I've seen some other bloggers giving their favorite picks for various categories, but I'm going to take a different route. I know how it feels to be a lesser known or unacknowledged blogger (because, um, I'm still in that phase myself!!!) so I'm going to give a great big shout out to some of my personal favorites from the honorable mentions. And, um, some of them are much bigger named bloggers than me and I honestly don't know why they aren't front runners in their own category! Shower of Roses has long been one of my favorite bloggers. She's been around forever, and her archives are a wealth of information and inspiration. I discovered her when I was a newlywed, working as a catechist (and possibly not even pregnant with Therese yet). Her family is big and beautiful, she homeschools, she bakes, she celebrates feastdays like none other, and she lives in beautiful Oregon. She's also one of the masterminds behind Catholic Cuisine. Wildflowers and Marbles is a virtual feast for the eyes. Whenever I get a peek at the pictures of Jennifer's home, I wish I could just pull up a chair and spend an afternoon there. She's also a bit of a Charlotte Mason guru, if you're interested in that sort of thing. My Child, I Love You was a big time winner of the Sheenazing Awards last year, if I remember correctly. Lindsay's family is absolutely beautiful, and her intense love for her children shines through every post. They recently had a difficult diagnosis for their youngest in-utero daughter, and Lindsay's reflection on all of it was beautiful. Her mother was also recently diagnosed with cancer, and their family could use a lot of prayers right now. Even in the face of all of that, though, Lindsay's family's love and beauty just shines through as an incredible witness of our faith. Harvesting Home is such a beautiful blog - both to look at and to read. I know Caitlyn in real life (I was in the same theology/philosophy department as her husband in college and we used to have ridiculous debates during study groups) and I promise she's as lovely in person as she is on her blog! But seriously, her blog is just a feast of lovely things and lots of inspiration and adorable babies, and you simply must hop on over there! So go, explore, and keep these lovely ladies in mind for the Sheenazing Awards next year (and add them to your blog feed this year).